Dogs require our lovable attention in many regards, and keeping their fur neat and tidy is one of them. My Shih Tzu can become a total mess in no time! For DIY home dog groomers, a visit to the groomer can require quite the $$$, depending on your pet’s size and coat type. 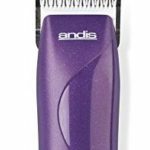 An Andis EasyClip from Amazon.com will pay for itself after 2 or 3 neat haircuts. For professional groomers, a flexible, sophisticated tool like the Andis AGC 2-Speed opens the way to satisfied pets and owners. Some people prefer grooming/touching up with scissors: they’ll love this Alfheim set from Amazon.com. For me? Well, DIY grooming my little one has always been all about the connection. My fluffie is both a companion and a sidekick. Feeling down? There’s this special someone to brighten my mood! I want to pamper it as much as I can in return. Here are the top best dog clippers and their reviews if you feel the same. Take your pick, depending on your preferences. All coat types, particularly great for thick coats. Medium coats. Cordless mode provides you with more mobility when grooming. Rotary motor at 5500 SPM. All coat types, heavy-duty grooming and heavy coat effectiveness guaranteed. Rotary motor at 3100, 3600 & 4400 SPM. #10 Cryogen-X ultra durable blade. Medium coats, perfect for fine hair and small to medium breeds. Fine and medium coats on smaller breeds. 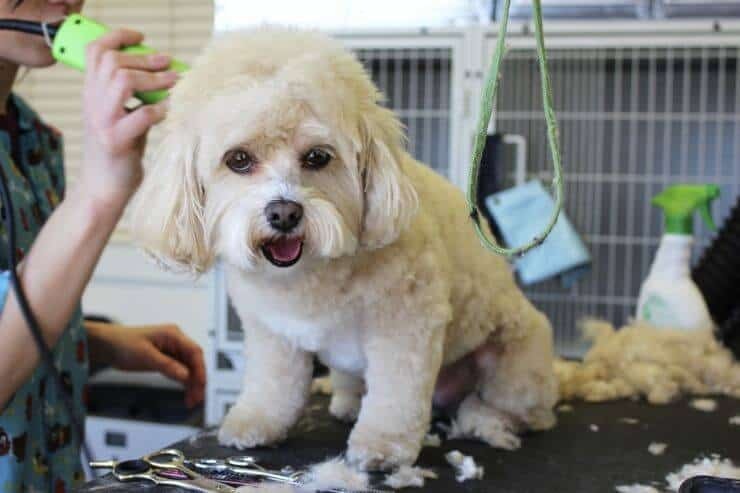 In this ultimate resource to grooming your pet with clippers, I’ll guide you through the best dog clippers and top best grooming scissors on the market. For your convenience, I have picked models suitable for different coats (medium, thick, fine) and varying in terms of price and brands. There’s a high chance you have an idea on what you want. If not, I’ve also prepared some quick tips on what to look for when picking one. BEST FOR: All coat types, especially effective as dog clippers for thick coats. 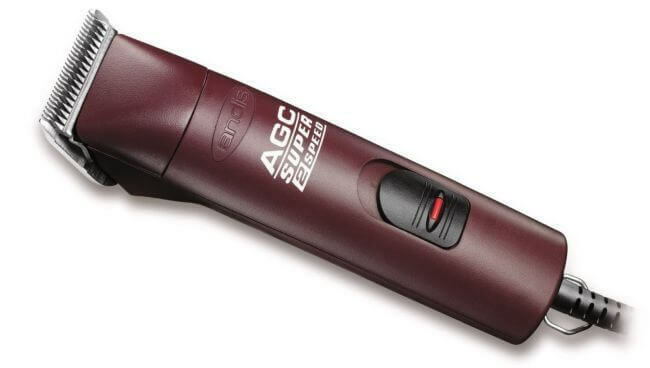 You can’t mention professional dog clippers without throwing the AGC in the mix. You can use this Andis model for any type of coats. However, I really recommend it as your choice of best dog clippers for thick coats. You won’t need that much power for finer hair, in my opinion. 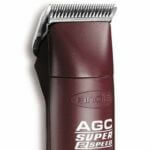 The AGC 2-speed comes in a very stylish burgundy color and an ergonomically designed body. They are a bit bigger than some other models at 7.13″, but still remain lightweight – only 1.1 lbs. This professional dog hair cutter is extremely durable on top of its elegance. A break-resistant housing will make sure the model lasts you long. Of course you’re probably more interested in performance. 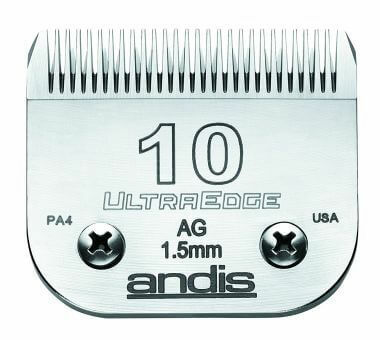 The Ultraedge AGC dog clipper comes with Andis finest rotary motor. It has a low speed of 3400 cutting strokes per minute, and a more powerful 4400 SPM speed. With 3400 SPM you can groom any medium coat without an issue. If you have a German Shepherd or another more hairy breed, though, sticking to the 4400 SPM is a must. The detachable blade you’ll get with the clipper is a #10 size one. For heavy coats you might want to get a #7FC size blade from Amazon.com (1/8″.) While you can use the #10 for the belly, head or legs, the #7FC is better for overall body grooming. The #7FC also runs a bit cooler than the stock blade you’ll get with these best dog clippers for thick hair. As any heavy-duty pet clippers, the carbon steel blades of the AGC do get hot. Semi-hairy breeds will take you no more than 15-20 minutes, so you won’t have issues there. This cutter is a great choice as professional dog clippers that are lightweight and powerful. If you have a breed that requires ultra strong action, though, you might consider the AGRV+ model from Amazon.com. With 5 speeds included, it goes up to 5000 SPM. BEST FOR: Medium dog coats, people who want mobility and built-in blade lengths to skip on blade changing. 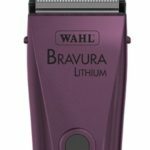 I recommended the Bravura in my previous list of best dog clippers for Shih Tzu. This model is a real piece of art and as an owner of one, I can’t vouch for it enough. Let me start with its ridiculously lightweight body. With 0.55 lbs, you won’t find any other pet grooming clipper giving you so much freedom. 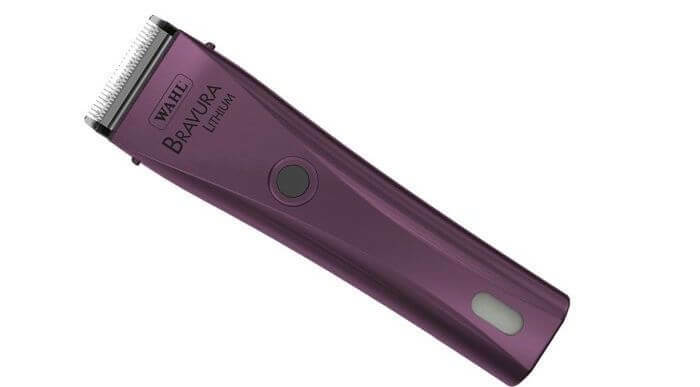 The Bravura also features a 5-in-1 blade system. You can switch between blades sizes 9, 10, 15, 30 and 40 depending on the area you’re grooming. No need to purchase additional blades and change them – just adjust as per your needs. The quality of the clipper blades is guaranteed by them being made in Germany. This Wahl masterpiece features a single speed rotary motor. 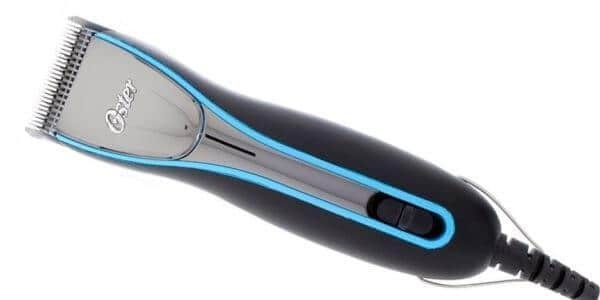 It’s quite powerful at 5500 SPM, in fact, perhaps the most powerful cordless dog grooming clippers on the current market. The motor doesn’t affect the battery life. You still get up to 100 minutes charge to forget about any cord clutter and simply focus on grooming your pooch. Aside from its lightweight magnificence, I adore the Bravura for two reasons. First, they don’t run as hot as other best dog clippers. Second, they are spectacularly quiet considering the power they have. If you have a pet that’s skittish and gets anxious easily, this is your key to restoring the peace and quiet in your grooming sessions. With these cordless pet clippers you also get an extra perk: they come in five different colors. I don’t know about you, but I’m easily swayed by eye-candy. The light blue Bravura version on Amazon.com immediately caught my eye and let me tell you, it’s just fabulous. Always makes me feel great while I’m doing some grooming. There’s not much to say about Bravura’s shortcomings. The slightly higher price is the only thing that stands out. It also can feel too lightweight for some professionals who prefer more solid pet grooming clippers. I want to also remind you that the Bravura works best on medium coats. Thicker coats might not net you the same outstanding results. 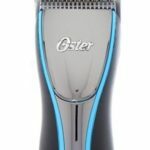 I know a lot of people swear by Oster’s A5 professional from Amazon.com animal clipper. It’s cheaper than other higher end best dog clippers and works well on all coat types. However, the A6 model completely outshines it in every single way. Let me explain how. First of all, the A5 weighs 2 lbs which can be quite tiring on your hands, especially during longer sessions. The A6, however, is more lightweight than a myriad of other best dog clippers with its 0.81 lbs. That’s a spectacular achievement consider its heavy-duty mode. The motor you have with the A6 is also better. You get a rotary motor with three speeds – 3100 SPM, 3600 SPM and 4400 SPM. The A5 Turbo clipper was limited to a 3100 SPM single speed and a double-speed mode of 3100 and 4000 SPM. Here’s where the A6 really excels, though: heat and noise levels. Similar to the Bravura, it’s spectacularly quiet on both low and medium speeds. Unlike the overheating A5, this Oster dog clipper won’t scare your pet off with a scorching body or loud operation. For people who don’t like too much maintenance, the A6 Oster pet clippers don’t require greasing. You should, however, oil the blades regularly to ensure they run as sharp as intended. Speaking of blades, this model comes with a Cryogen-X #10 blade. Once again, for a proper body grooming, you might consider getting a #7 blade (1/8″) or even a #5 one (1/4″.) The lack of additional accessories is where the A6 disappoints a little. At a so-so similar price range, the Wahl Bravura has the 5-in-1 blade system so you don’t need to purchase additional grooming blades. That said, the A6 ranks among the best dog clippers for thick hair. While the medium speed is great for medium-sized dogs with semi-thick coats, the 4400 SPM mode will cut through thick coats like butter. A truly spectacular set of Oster’s finest! Substantially cheaper than the other best dog clippers listed above, the EasyClip still performs amazing. There’s a reason it’s one of the most popular pet clippers on Amazon. That said, I have to warn you: it’s intended use is for medium coats. The EasyClip is quite light at only 0.9 lbs, and compact too with its size of just 6.88″. 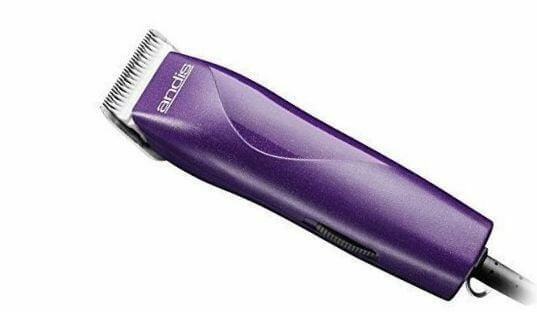 Sticking to usual Andis dog clippers standards, its hard polymer body is break-resistant and very tough. A long 12′ cord ensures you can move around easily for your and your dog’s convenience. As you can expect, the rotary motor here is a bit weaker than other previous best dog clippers. The EasyClip has a single-speed motor with 3700 SPM. Not that great for thick hair, but more than good for medium coats. Very satisfying considering this model’s price. What I love about the EasyClip are the CeramicEdge blades. They stay cooler and sharp longer than standard steel blades. It’s really amazing that Andis have included these here. You also get some accessories: 4 combs (sizes 1/8″, 1/4″, 3/8″ and 1/2″) and a hard case to store them in. The noise levels aren’t as low as the Bravura or ProClip, but you shouldn’t worry about the clipper being too noisy. It won’t stay completely quiet, though, so keep that in mind. In case the EasyClip blades get hot (happens with longer grooming sessions), simply use a cooling spray or rest a little. While I’d say these are the best dog clippers for small and medium pets if you’re on a budget, don’t think you’ll be able to flawlessly groom German shepherds here. For breeds like poodles, schnauzer-poodles and other similar dogs you’ll see outstanding results. If you’re looking for a mix between performance and price, these are the best dog clippers to meet your requirements. Aside from the a bit weaker motor and blades getting hot with longer sessions, the EasyClip goes well and beyond expectations. Don’t equate cheap prices with low quality or lackluster performance. It’s all about what you need the best dog clippers for. 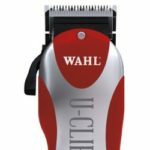 And if you’re looking for grooming fine to medium coats on smaller breeds, the Wahl U Clip is your most affordable option. As I said, a lower pricing point doesn’t mean lower quality. The U Clip comes with very sharp stainless steel blades. They adjust from size #10 to #15 and #30 blade lengths, which allows for good customization with coat grooming. Wahl could’ve easily made this a fixed #10 blade, but the brand’s though of our grooming sessions. This clipper for dogs is a bit heavier at 1 lbs, but isn’t that bulky at 6.5″. The motor performs beyond expectations with its high speed of 7200 SPM. Remember, though: you’re limited to smaller dogs with fine to medium coats. Don’t mistake the motor’s power with it being able to treat thicker hair types. There’s other good news – you receive a spectacular set of accessories with the U Clip. The 16 piece dog grooming kit includes best grooming scissors, 7 guards (starting with a 1/8″ one), a styling apron, pet comb and others. Quite the surprise and something that’ll make you feel like a professional dog stylist! Where the U Clip falls short is its relative noisiness. Its 8′ cord is also a bit shorter than what some other best dog clippers come with. Once again, this is not a true heavy-duty machine. It’s great for maltese, spaniels and other not that demanding (in terms of motor power) breeds. Big dogs with their thicker, matted hair are out of the U Clip’s league. All said and done, though, if you’re looking for cheap best dog clippers for your small adorable pets, you’ll love this model. With the dog grooming kit included, the U Clip is simply convenient, versatile and professional. Sometimes you don’t want to work with the best dog clippers. Instead, you’re willing to give the cheaper option a try – yes, I’m talking about dog grooming scissors. Luckily, this is a very competitive industry, so there quite a few high quality best grooming scissors around. Again, in line with your budget and preferences, I have prepared you three best grooming scissors reviews for grooming your pets. Every single set of these best grooming scissors will serve you and your pooch impeccably! You can’t ask for a more deluxe set of shears for dogs than this Alfheim treasure. It features a full suite of 4 pieces for all your needs. You get a 6″ inch set of cutting scissors, 6″ thinning scissors, 7″ up-curved scissors and again 7″ down-curved scissors. What makes these the best grooming scissors? Their unmatched quality, both in terms of design and operation. First of all, Alfheim have taken care to provide us with incredibly durable, long-lasting and sharp stainless steel blades. They can be smoothed by using an adjustable tension control knob. Second, this just might be the best dog grooming shears in terms of ergonomics. Curved design and elegant thumb holes allow for easier maneuvering and less strain on your hands. Any long session will be pure bliss with this set of best grooming scissors. Notice the blue inserts in this set of professional grooming shears. These protect the scissors from digging into your fingers and applying unnecessary pressure. 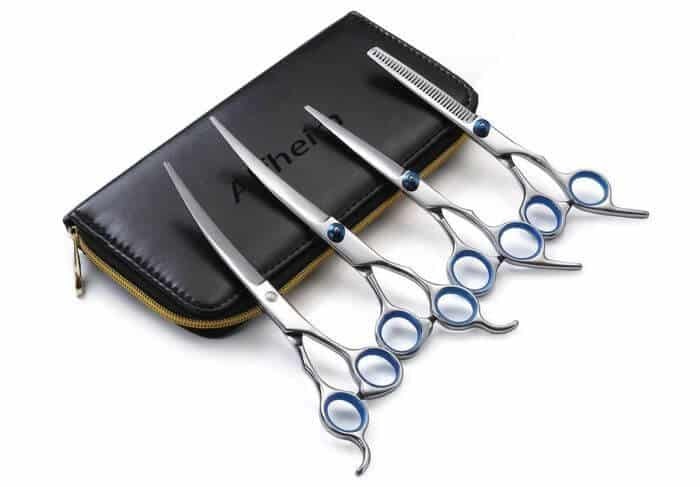 This little touch also make the Alfheim pet scissors one of the best grooming scissors for people with smaller hands. Last but not least, you’ll receive this set in a stylish case. Furnished with padded protection, it will store your best grooming scissors safely and with elegance. They are especially great for poodles, as I note in my poodle clippers/shears list. Pet Magasin’s offer also focuses on a mix of quality and functionality. 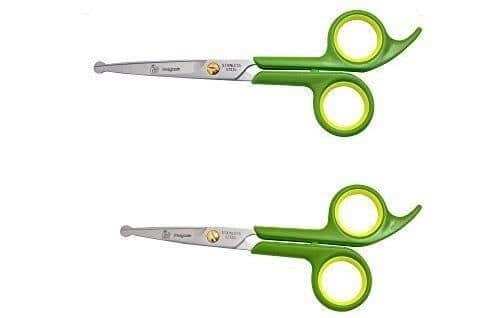 While not as elegant as Alfheim’s tools, these dog shears will let you perform marvelous haircuts on all coat types. You’ll receive 2 pairs of best grooming scissors here. The longer pair (~6.5″) takes care of body fur trimming and bulkier tasks. The smaller pair (~6″) is designed to deliver gentle grooming around delicate areas such as the face and paws. What I love here is the additional measures Pet Magasin have gone through to ensure your pet’s safety. Those potentially best grooming scissors come with rounded tips so you avoid poking your pet, especially when grooming around the face. Very clever and extremely convenient if you’re a bit clumsier or anxious to trim there. The stainless steel blades are also very easy to lubricate or sharpen. You only need to undo a single screw and you’ll be able to do so. However, these last for long, so you shouldn’t encounter too many problems. This set is the best grooming scissors for left-handed people, in my opinion. Convenient, cozy handles and extra finger rests will help you through the otherwise tiring longer sessions. A great option that also allows for more silent haircuts. Vastar focus on delivering an all-in-one set to address any pet owner’s grooming needs. 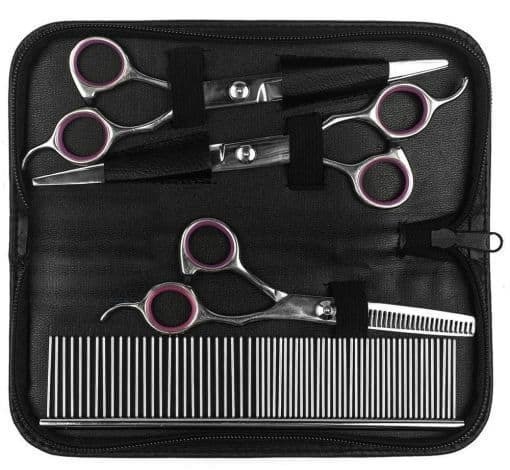 The kit includes curved scissors, a cutting shear, a thinning shear and a grooming comb. You also get a cleaning cloth for continued maintenance. The thinning dog shears measure around 5″, with the other components adhering to the standard 6.5″. All tools are very ergonomic, light and quite maneuverable. What I like here is the full-on stainless steel body of the grooming shears. It’s very stylish considering the price – definitely one of the best grooming scissors set out there. One of this best grooming scissors set’s specific strengths is the muffler pad on the pet scissors. It allows you to cut very quietly, so even extremely anxious pets can rest easy. Check the pink rubber on the handles: this is Vastar’s silent secret here. While not as deluxe as Alfhaim, the brand still gives you a cleaning cloth with the dog shears kit. In addition, if the tools should ever get loose, you can tighten them up using your fingers easily. Quite the convenient maintenance and a great treatment from the company. My only remark is that these best grooming scissors for dogs might feel a bit tighter on bigger fingers. Otherwise, given the fact that these are the cheapest option among these best grooming scissors reviews, Vastar’s tools are outstanding. “What are the best dog clippers?” is a question that gets thrown around quite a bit. Yet the truth is, it all depends on a) what dog breed do you have, b) your grooming habits and c) your level of proficiency. In other words, the concept of best dog clippers to you might different from what someone else will think of as a perfect machine. Here’s a general FAQ to help you orientate yourself better. What do you want to use your dog clippers for? Different strokes for different folks: you might prefer lighter overall maintenance, or you might be a total stylist freak. Your pick of a grooming tool will vastly vary depending on how frequently and religiously you take care of your pet’s looks. For casual trimming on smaller areas like legs or ears, as well as light grooming, you don’t need an expensive model. A Wahl U Clip for example will be enough. For semi-dedicated coat maintenance without too much styling or detailed work, you’ll need a medium-grade clipper for pets. Andis EasyClip is a good choice, especially if your dog is a bit bigger and has a medium coat. For longer, stylist-grade grooming sessions with lots of detailed work involved, you only want the best professional dog clippers. Huge concerns here are how hot will the machine’s body and blades get, as you can’t avoid that with lengthy haircuts. You also need to consider the weight of the pet clipper, as well as its mobility. What kind of a coat does your dog have? Everybody wants to groom an enormous dog with thick hair with sub $40 pair of clippers. You have to understand, though – this is very unlikely to happen. The thicker your dog’s coat is, the more expensive dog grooming clippers you will need. For thin/fine coats you need basic power with not that much strokes per minute (SPM.) Standard stainless steel blades work more than well. As these kinds of haircuts also take less time, you aren’t that concerned with the clipper’s weight. Medium coats call for a mix between power and price. Ideally you want something with 3300 SPM or above, a stronger motor. Things like the blades heating and how heavy the machine is start to come into play. You might also need some blade adjustments to do a more thorough job. Thick and heavy coats are where you need true professional pet clippers. Best case scenario, you need a two-speed clipper (or better) that has a mode with over 4000 SPM. Things like ergonomic design with no vents (that get clogged and heat up the body) become quite important. The more lightweight and cool-operation ready the machine is, the better. Also, you might additionally look into dog blow dryers: you’ll want clean fur, and post-bath time can be hard with especially hairy dogs. A well-clipped dog will also make an impression on everyone in your neighborhood when you take them out for a walk. Just remember to take care of your and their safety too, along with the well-groomed looks. My friend Kate has prepared a relevant guide on harnesses for bigger dogs like huskies, who also have a thick coat. For the novice, things like dog grooming blade lengths and how/where to use them can feel quite overwhelming. Don’t worry! With a little help you’ll get quite good with dog clipper blade sizes in no time. Here’s some tips from me. First of all, most dog grooming clippers come with a stock #10 size blade. It cuts at 1/16″ (1.5mm) and is great for stomach trims, feet trims and face trims for some breeds like poodles or terriers. It’s really the standard for the industry, though it cuts a bit too close for some people’s taste. Here’s the thing: there’s a lot of dog grooming blade sizes out there. Lower numbers indicate that the blade will not cut as close, leaving a longer coat. Higher numbers equal very close cuts. If you’re feeling lost, here’s a dog clipper blades size chart to help you choose the perfect best dog clippers. However, many of the measurements adhere to other brand’s lengths too. T-10 and T-84 blades have a wider cutting surface than usual blades. They are better for large breeds and thicker coat types. Don’t expect to use them on poodle hair, for example. FC blades are finish blades – you will use them on clean, dematted coats. The same-size skip tooth blades are used when removing coat in bulks, no matter whether it’s still matted or not. Great site , as a new user to clippers and baffled by options,this gives all the information I need to make an informed decision . Thanks for the time and effort to post this . ?